In this Complex Consumer Product Modeling in Rhino 3D training course, expert author Rob McCulloch will teach you how to create and model a walkie-talkie for consumption using Rhino 3D. This course is designed for users that already have a working knowledge of Rhino. You will start by learning how to import and scale 2D images, then jump into drawing main body curves. Rob will then show you how to create a walkie-talkie, including the body, antenna and volume knob, and front controls and LCD. This video tutorial will also teach you how to add the speaker grill to the walkie-talkie using polar array, as well as adding a battery door. You will learn how to set up the model in Rhino for rendering, and import data into Keyshot to adjust lights and add decals. Finally, you will learn about three render modes and the final render output. 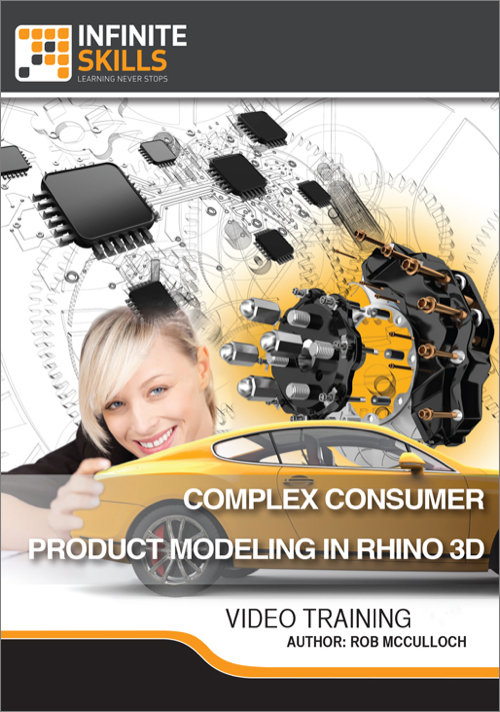 Once you have completed this computer based training course, you will have an in-depth understanding of how to create your own consumer products from scratch in Rhino. Working files are included, allowing you to follow along with the author throughout the lessons.